Round 2: the week of breakevens. At least, the last week we have to evaluate our players and their breakevens before the fluctuations kick in after Round 3. So this week’s edition of the Bullets will be largely concerned with breakevens, fix-it trades and the like. Get in and check it out! Round 2: the week of breakevens. At least, the last week we have to evaluate our players and their breakevens before the fluctuations kick in after Round 3. Because of that, this week’s edition of the Bullets will be largely concerned with breakevens (BE for short), fix-it trades and the like. Anyway, back to Round 2. Some large scores from our midfielders and hugely variable scores from the gun backmen means that you could have topped 2200, or easily failed to make 2000. The 50-50 calls you made in the pre-season are now undergoing the transition from well-reasoned decisions to boom or bust in perfect hindsight. Such is the game of AFL Dream Team! I don’t know how many times it has to be said, but you just don’t trade Round 1. Under any circumstances. Even if there is an LTI. There is absolutely no long-term advantage to it! Firstly, non-trading stops you from knee-jerk trading on the back of one solitary poor performance – more on this in a minute. Secondly, it stops you trading in a player on the back of one solitary exceptional match – again, more on this in a tic. But thirdly, and most importantly, you don’t trade before you get to see the breakevens. In the Guns and Rookies DT world that we currently live in, breakevens are the currency that governs how we value our trades. They are essential in the money generation of our cash cows and the acquisition of underpriced premiums, so don’t ignore them. If this is just a lot of gibberish to you, so here are some examples of popular trades this week that never should have been executed. I didn’t pick him myself, but if you did, you did it for a reason. A first-up effort of 29 was disappointing to be sure, but it was one game, in a big loss against a club with a top-3 forward line who employs the forward press – let’s gain some perspective here! Sure enough, in a much more DT-friendly game style employed by the Crows, Lake rebounded with 93. And look at that – his BE is 44 next week, meaning if you had kept him, he’d likely be making you a little cashola this week. Plenty of Porplyzia owners were ropeable last week that the oft-winged Crow scored just 58, while teammate Callinan, at a very similar price, managed 99 in the season-opener. But here’s why you shouldn’t have pulled the trigger after just one week: Callinan scored 21 and Porps got to 83 in Round 2. Both have fantastic breakevens (21 and -9 respectively), but you’ve just wasted a trade. Fool. As a fellow Broughton owner, I understand the desire to get him the hell out of your team. But as a fellow DTer, I urged you to keep him in last week’s Bullets. Not because he will come good, but that he could. And at the very least, you’d have a better idea of who the best replacement who would be after another set of data. And that is none of above I’m afraid. Hanley (120), Adcock (125) and Duffield (98) all had high scoring games last week, and with all these guys at an equal or lesser price to the role-changer, I’m sure it looked like a good idea. So while Broughton only scored 67 this week, he still outscored all these guys, with Hanley notching 58 (80 BE for Round 3), Adcock 52 (95 BE) and Duffield only 40 (100 BE). That’s the danger in picking up a player after one round – the two Brisbane guys only had Melbourne’s pathetic forward pressure to deal with, resulting in points galore to the backline, whereas Duffield was taken to hospital with a rib injury in Round 2. I know what you’re thinking – Broughton has a BE of 145 this week, and I don’t deny he needs to be considered for a trade. But surely you’d agree that Waters (83 and 103 with a 34 BE) Carrazzo (106 and 98, 92 BE) and even Nick Malceski (83 and 88, 41 BE) look like better options now? As you probably have noticed by now, one of my favourite post-round exercises is examining team scoring, and the effects that different teams will have on any opponents’ DT production. The same concept has been successfully applied to Sydney over the last decade (low scoring due to a stoppage playing style) and, more recently, has been applied to Hawthorn and their scoring dominance. It’s only two weeks in, so we can only fish out the clearest of trends. As you can see, there are two outliers there, where the scoring for the match was right up despite the margin being within 4 goals. One was Collingwood vs Richmond, which was a game in which the Tigers played a lot of possession footy. I mean, Rance scored 138?! 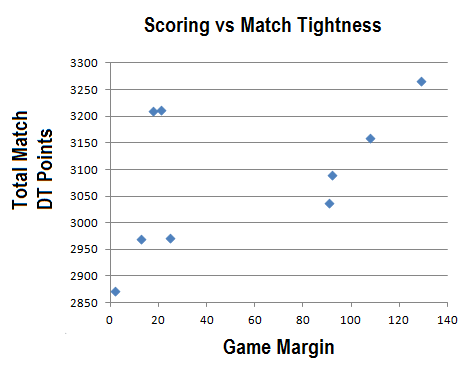 The other was Adelaide vs Bulldogs, two sides in which we have seen fantasy-friendly scoring from so far this year. 2. Melbourne, Gold Coast and GWS are easily the three worst sides, and if you play them, you score big. All three clubs lost by more than 90 points, and had an average DT point differential of 613 points – that’s an extra 29 points per player! Basically, if you have a lot of players from the teams coming up against any of these teams, be prepared for a huge week. The highest score of the week is usually a pretty good qualification for the Makers, and that’s exactly why Ablett is there this week. Despite having a 50 point first half, he turned it on in the second, scoring 93 over the last two terms. His 143 came from 40 disposals and two goals, in another exceptional performance from the little master. Congratulations to those who stuck with him as Captain, despite the Clinton Jones factor. Is James Magner the new Barlow? I’m sure that’s something we’ll hear in DT circles for weeks to come. Barlow v3 maybe (after Curnow emerged last season…)? Anyway, the Magnet showed why he is called exactly that, managing to find the footy even though West Coast dominated the possession count. When a 2nd game player top scores with a ton for the team belted by 100+ points, you know they’re a gun. Keep him glued to your M4-6 spot while he’s churning out hundreds. Last week we had a unique Essendon gun in Stanton in here, and while he was fantastic again, his captain Jobe Watson was even better. His uniqueness (in only 9.5% of teams… K. Hunt is more popular) is what makes him a Maker this week, scoring 139 courtesy of a huge 13 tackles. 54 hitouts equals 54 points. I mean, 54 points is like a good game for Broughton, but Sandilands scored that before even counting his possessions. The big 211 added 19 disposals and a goal to get to 124, the most by a ruckman this week. I spruiked him all pre-season but was scared off last minute by his calf ‘injury’ – if you stayed on board, well done so far! The only defender to make the Makers this week is Beau Waters, who comes cheap at $338k but is scoring like a $400k+ champ. He made it to 103 against a barely-there Melbourne forward line, kicking 2 goals from 21 possessions, with a huge 20 kick:handball ratio! His big bump on the walking injury (Grimes, maybe?) had a few worried, but he made it out with just a reprimand and a few points to his name. I mentioned him earlier but Callinan’s tease of a 99 backed up this week with a paltry 21 has to be the biggest week-ruiner. This is without a vest, and including a goal. 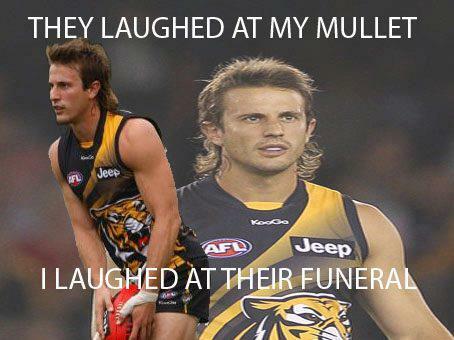 He just couldn’t get the footy, only picking up 7 touches. Bryce Gibbs was talked up all pre-season, finding himself in more than a few teams as a point of difference in the midfield. He looked great in Round 1 with a first-up ton, but was barely sighted against the Lions, managing just the 57. His link up either wasn’t there or wasn’t needed, uncharacteristically taking only the two marks for the match. Mitch Golby aka Trollby finds himself in the Breakers this week, after personally wronging the author. Last year I got sucked in by Yarran and I’ve talked about the Yarran Dilemma all pre-season, with Hargrave and Golby the two most likely to fool me. In the end, I went with Golby after he showed a greater ability over the Nab Cup to win the footy himself and not rely on team style (like Hargrave and the Bulldogs’ possession-happy footy). Wrong. Trollby has decided to play a lockdown role this year – hooray for unearthing the next Broughton, Vossy. His 42 this week hurt, especially with Morris and Ellis more productive off the bench. His BE is still low, so maybe he gets one more week to redeem himself against a Ballantyne-less Freo. Rockliff was a non-factor in Round 2, managing only 61 points after his impressive medium-forward display last week. His 17 disposals is the first time he’s dipped under 23 touches in a game since Round 9 last year, which was also the last time he produced under 95 points. Greg Broughton. 67 points. Need I say anymore? Until he scores over 80 points, he’s almost a lock in the Breakers. I talked about fix-it trades last week, and the time has come to seriously consider them. With league matches coming up, now is the time to patch up any chinks in your team’s armour, and I’m here to help you do it. Here are a handful of players that you might be keen to trade out, and my recommended replacement for them. I’ll also add a stat which I like to call a ‘future profit’ – the amount of money you are likely to be better off after one week, according to Assistant Coach projections. No surprise that Broughton will be a big out this week, but who will be his replacement? If you missed out on Goddard/Deledio/Carrazzo/Birchall and you have the cash, you might want to play it safe and get them in. But what if you’re penniless? Waters is your best value bet who can score at a premium level. His BE is 34, meaning he’ll definitely increase in value this week, and he’s scoring freely with an 83 and 103 in the first two games. And you just know, when the going gets tough and the Eagles come up against a Collingwood or a Hawthorn, Beau will be the guy they turn to for the switch in defence. Golby only has a BE of 54 which he’s probably just going to achieve at this rate, but you just can’t see him lifting his price through increased scoring with his current role. Meanwhile, Hargrave is continuing on nicely with his pre-season form scoring 79 and 93 for a Round 3 BE of -20. If you’re going to pull this trade though, it has to be this week, because Hargrave is like the opposite of the prices at Coles. With an expansion team, you have to expect there’s going to be one highly-rated guy who scores poorly, and one guy who went under the radar but ends up being the goods. Last year it was probably Brandon Matera and Trent McKenzie, and its early days yet but it looks like being Tyson and Greene in 2012. Tyson is a great player but hasn’t been given an opportunity to score due to the dreaded sub vest, while Greene is just a younger Selwood – so hungry for the footy that the universe just bends to his will and he ends up with it. To earn 99 and 107 in back-to-back thrashings you’ve obviously got the ability and the job security to go with it. Dickson had a horror first week and a vested second week, leaving him at an average of 31 with a BE of 1 for Round 3. So he will increase in price, but what about his job security? And the likeliness of future vesting? And are you willing to miss out on Milera’s guaranteed price rises over the next 3 weeks? After scores of 74 and 85, Milera finds himself with a BE of -84, 2nd best of the non-Giants (Magner is first). Bear in mind though, the Saints have played Port and the Suns in the first two – it’s likely to get much harder for him. Great question Griff! This is a tough one, and I think it’s hard to quantify. For me, it’s when you lose faith in them to score like a premium when they’re at their best. For instance, last year I had started Didak as a premium, but quickly realised he wasn’t going to be the Gun I paid for. A swift trade to a rising Fyfe helped fix that mistake. I still have faith that Martin will be a gun this year, and it’s only a couple of average games in a tough draw for Richmond that has prevented him from showing that. With Shaw, I still have faith that he can score well, especially as he’ll escape the forward tag after a couple of ineffective games. Broughton is quickly becoming an expensive mistake however; I’m losing faith that he’ll score the 80+ I need from him. He’s fit, but not playing the right role, and I’m not willing to wait for injuries to hit Freo like last year. It’s too early to tell I think. Dickson has had one bad game and was the starting sub, so it’s almost the same situation as last week, where we don’t have enough data to make an educated call. His price increase will be slow for sure, but on the other hand, how good do we think Milera could be? Personally, I have bigger holes to patch, so I think this one is a bit of a luxury trade. But its one I would probably take if I had weak forward rookies filling that F7 slot, such as Hall, Hampton and Smedts. And if he drops off, at least Milera is guaranteed that sharp price rise (see above section). Interesting. High risk but high reward if it comes off (85+ average as a P.O.D)… If you were set on trading one of those out, I would probably get in someone that we’ve seen so far like a Waters, Hargrave or Carrazzo ($455k, 102 avg), rather than someone we haven’t seen play yet. I just feel like its safer, which is really what we’re looking for in a fix-it trade. As I mentioned earlier, look for players coming up against the weaker teams to score well; I’m talking Deledio and Martin from the Tigers (against the Dees), Stanton, Watson and Zaka from Essendon (versus the Gold Coast) and of course the West Coast players who take on a young GWS. Also, remember that League matches start this week – even more incentive to get your team ship shape! PS: Sorry about the length – which so much happening over the first couple of weeks, I haven’t felt comfortable leaving anything out! Promise I’ll cut down in the words in the coming weeks. Should I save a trade and just get Bock in or should I trade out Coniglio for Greene to afford Birchall or Carazzo? Other option would be to trade out D. Smith for A. Kennedy to afford the broughton trade. Personally i’m probably going Coniglio to Greene this week, just haven’t been happy with Coniglio’s output and Greene will gain a tonne of money this week. I say do it. I would trade out Dickson because WB have a tougher draw that GC. Would also think that Hall would be more likely to keep his place in the team… But wait for game day, maybe one will get dropped this week. Kennedy or Milera for Dickson? otten needs to go, thinking hurn or watters? or splurge on carratzo? Not sure weather to trade Enright or shaw for lids? Hey guys! I selected leuenberger to get an edge over all the fools who didn’t pick him, but there was a very good reason they didn’t… Hudson has stolen the ruck, leaving the berger to be a full forward…. Should I stick with him, or trade to ryder or someone? I have the 1 under performing starter in Golby, so i think it is time for him to go?? I would also like Greene in. So looking at moving Kennedy from Mid to fwd and then trading Hall. this breaks my DPP in the mids, but can probably be fixed with later trades (if needed). I’m assuming everyone who is doing the cogs to greene trade has already got magnet. Because I had cogs and not Greene and magnet, and I thought magnet was definitely a better option….